Allweatherwindows offers a wide range of products, including casement windows, tilt and turn windows, fully reversible and vertical sliding windows, bay windows and Coloured Windows. As well as windows we are able to offer a wild range of doors, French Doors , sliding patio doors and residential doors. 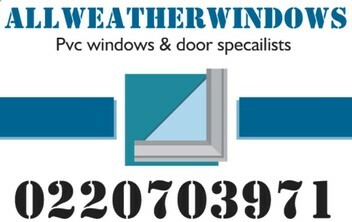 Absolutely top recommendation for Nathan and All Weather Windows. After research uPVC was definitely the choice and there was one clear winner. It is a superior product with steel reinforcing and security features. The quote was also the cheapest we received. We were blown away by the speed, professionalism and knowledge of Nathan and Adrian. Their attention to detail and clean up after removing and installing 7 new sets of windows was outstanding. We are 110% delighted with the windows. Thanks! Awesome Job from Nathan. He just transformed my windows to pvc double glazing in an affordable costs. Highly professional, very reasonable and extraordinary work. Nathan gave me the cheapest quote, being honest his quote was even cheaper to others who quoted only for the glass - but Nathan gave the best price for glass+frame, great work - very happy, highly recommended.